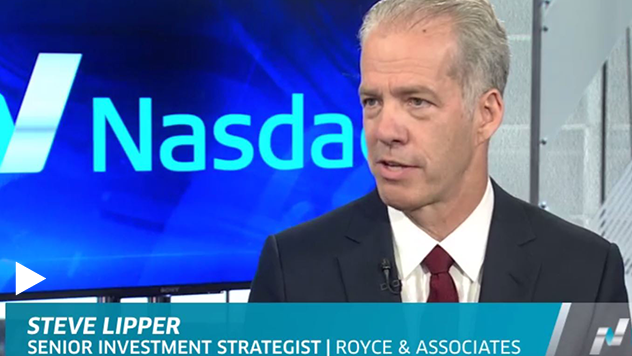 Senior Investment Strategist Steve Lipper joined Nasdaq TradeTalks to discuss where Royce is finding small-caps at the intersection of quality and value. On August 21, 2017, Senior Investment Strategist Steve Lipper joined Nasdaq TradeTalks, hosted by Jill Maladrino to discuss why small-caps are a compelling investment opportunity. Steve discussed the inefficiencies in the small-cap space that could present opportunities for investors: "There's roughly a third of the number of research analysts that cover the average small-cap stock as the average large-cap stock. So you might think there are some inefficiencies with that, and even more so there's hundreds of small-cap stocks that have one or zero analysts covering them so you’re probably going to have more opportunity to identify this pricing in the small-cap world." He also made observations about the overall market and what might be next, "We think we're overdue for an increase in volatility. So if you look at the last 20 calendar years, 18 of the 20 have had at least a double digit dip within the year. The average decline in small-cap is about 14%. Up until recently it’s only been about 5% so we have been saying and building some cash in our portfolios anticipating some better prices to go and purchase at. However, we will be buyers of that dip because we believe in small-cap are the early part of a multi-year cycle." Last, Steve mentioned what people might be missing about small-caps, "The small-cap cycle is new. We just had a bear market, which ended last year, in our view in February of 2016. So we're only a year and a half old. So when people talk about an aging bull in terms of the large-cap, that may be true but small-cap, we think, has room to run."